The week started out on the wrong foot. I got nabbed by the Armada and was held in a brig on one of their ships. Thankfully Temujin came to rescue me with his old friends Boochbeard and Gandry. On our way out we found another captured soul, Kan Po, a Goat Student from Mooshu. We blew out of that ship in a hurry and headed for Skull Island on Boochbeard’s ship. 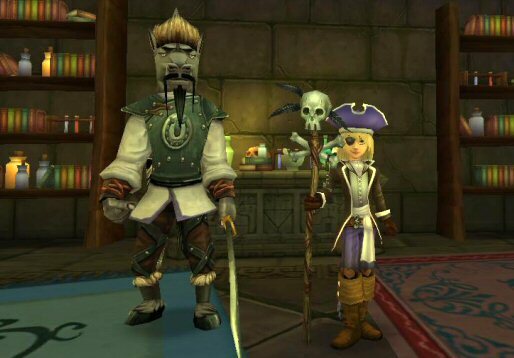 He and Gandry sent us to meet with Captain Avery who sent us on a mission to recover a stolen amulet he had lost. We had to do a little fighting against some Troggies and Cutthroats, but it wasn’t too hard with our new friend Bonnie Anne. 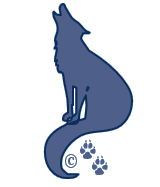 She’s a feisty musket caring fox and good to have in a battle. Especially against the Cutthroats! We found some lost friends of Captain Avery and located the necklace. It had been stolen by Fin Dorsal. For some reason, Avery was surprised when we returned the amulet necklace in one piece. I don’t know why he thought we might steal it for ourselves. Where does he get these ideas. As a reward he promised us a ship and he did stay true to his word. We have acquired our first ship! Well boat. Ok it’s a raft, but it’s mine! Temujin and I are very excited about seeing our flag waving from her mast in the cool skyway breeze! 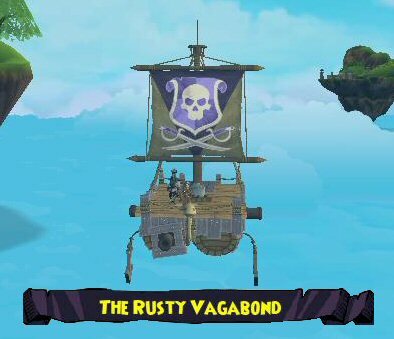 She’s called the Rusty Vagabond! She was named by Captain Avery. I guess he thought that was a good name for a Hoodoo Witch’s ship. For what it’s worth, we like it! Avery asked if we would help out with another little problem. Finding Captain Gunn’s treasure. Our first treasure hunt! We headed to the tavern to get Gunn’s Will and we found that Ratbeard was already in fight to give up the will. Of course we joined in the fight. Ratbeard got away, but we made another new aliance with Mormo, a Water Mole Witchdoctor. It’s nice to have another witch to talk to and learn from. He has even learned a few things from me. On our way to the docks I realized for the first time in my life we’re able to get off Skull Island whenever WE want and not have to rely on the “kindness” of another Pirate Captain to travel the Spiral. That doesn’t happen to often. Now we can set sail for exotic lands and new worlds in our very own ship! And I’m excited that all our new friends wanted to become part of my crew. I’m a real Captain now! We set off to Blood Shoals where we met up with some poor souls that had been killed by Captain Ratbeard. We took care of them and picked up another new crew mate. Lucy Sterling a Mouse Fencer. She had discovered a secret map prepared by Marco Pollo. We spent the afternoon in the Tavern and deciphered the map. Our quiet conversation was overheard and we picked up yet another crew mate. Mu a Ninja Pig also from Mooshu. At this rate we’re going to need a bigger ship soon! I’m not sure how I keep finding lost Mooshu folk. But each one of them has been great in a fight so far, so I’m not complaining. We’re on our way to Jonahtown now. I’m excited to see it. I’ve heard of the great whale town, but I’ve never actually been there. New Adventures Await! I wonder what we’ll find.